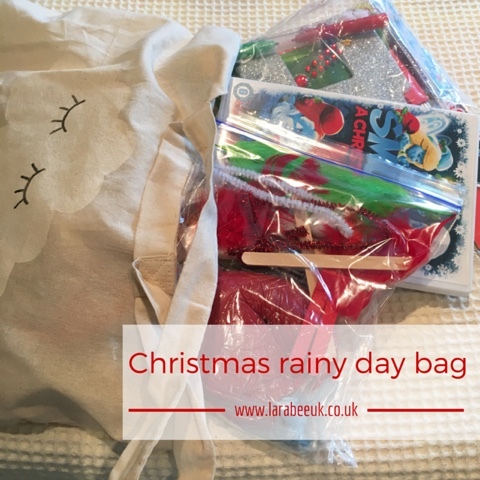 Back in the summer I made a rainy day bag which I filled with a number of activities to get us through rainy days. You can see what we had it in originally here. I must admit I've changed things up a few times through the summer and autumn and we've used it quite a few times for rainy days or car journey, taking to friend and relatives houses etc. It's really useful to have everything in one place to grab quickly. Especially since T seems to have upped his pace to warp mode all the time! Everything he does is at high speed now and he can't wait for anything! So I thought I'd change all the contents of the bag for Christmas, I think I'll do this every couple of months in the next year or so because it really has been such a godsend. I have added the Christmas CBeebies art magazine, I can't tell you how much T loves this magazine, I think for him it had just the right amount of arts and crafts, stickers and his favourite characters. I also added a set of Christmas stickers he got in his Christmas kids sticker swap last year. A new book has also been included, it isn't a Christmas book but it is new so I'm sure this will be a huge hit when he time comes. 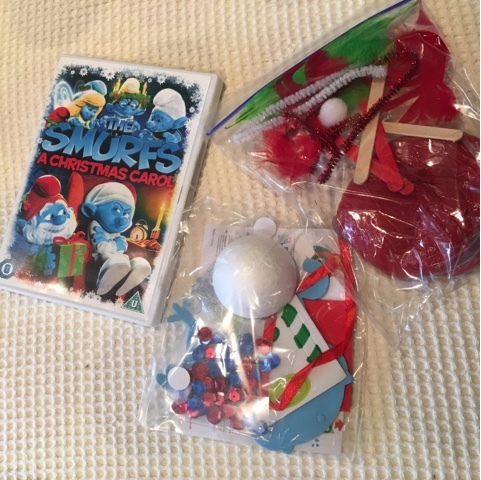 Some homemade play dough was next, along with some loose parts, a small Baker Ross ornament kit and a DVD. 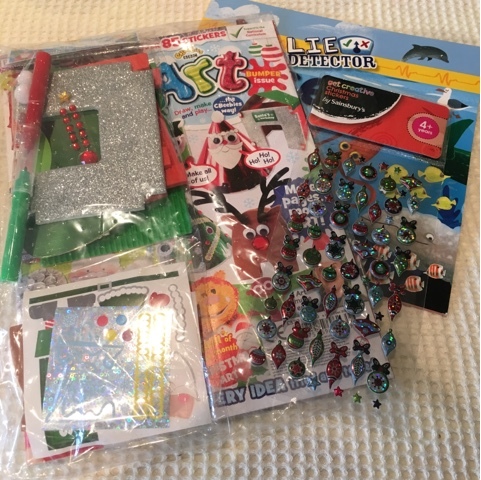 I'm really pleased I have my little bag of goodies for when I need to keep T entertained, without me having to think! What would you include? I'm even thinking that a filled bag would make a good gift for one of T's friends for Christmas or birthday. In awe as always. When we go somewhere like the doctors or a restaurant, I am always scrabbling around at the last minute trying to find crayons etc... I really need to do this.